Home Read the Label(s) Order Some We Make It Christmas Trees Too! 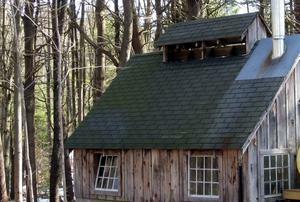 We've been making Maple Syrup on our hillside in Southern New Hampshire for over 50 years. (A porcupine takes shelter under an old evaporator down in the valley.) Our syrup has ONE ingredient, sap from our 200 maple trees, boiled to perfection over a wood fire. Sometimes it's called "truthiness in advertising..." There's a lot of stuff out there masquerading as the real deal, even "maple-tasting" table syrup. Don't be fooled. Read the label. First Place Recipient - 2017 Lawrence A. Carlisle Memorial Trophy awarded by the New Hampshire Maple Producers Association.